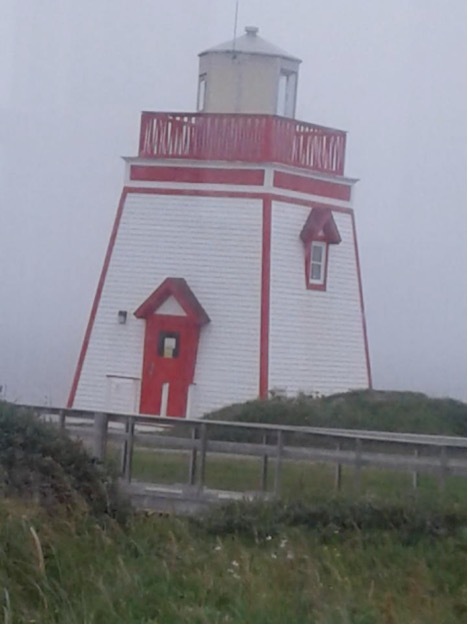 Sector expert Ron Struthers takes a trip to Newfoundland and reports on companies working in the province. 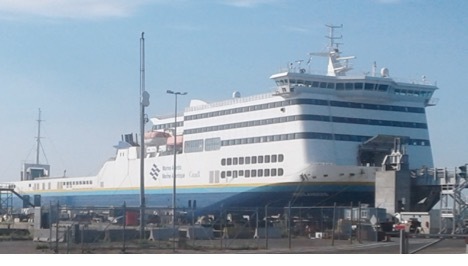 It was a wonderful day and perfect weather for the ferry ride from Sidney, Nova Scotia, to Channel-Port aux Basques, Newfoundland. One thing I noticed strange on my first several days of travel in Newfoundland were all the high voltage electrical transmission lines. They seemed numerous and going everywhere, although nothing is really there. For the most part Newfoundland is barren land with only around 550,000 people across the whole province. And Newfoundland/Labrador is larger than New Brunswick, Nova Scotia, and Prince Edward Island combined, although you could eliminate half of it (Labrador) as there is little development other than resources. About 95% of the people live on Newfoundland, and the island has about 25% of the population of the other three eastern provinces I’ve mentioned. As you know I have a keen interest in energy and alternate energy. I could not help but wonder, where is all this power going in a province where growth is stagnant and the population has been stuck in the 500-550,000 range for decades. 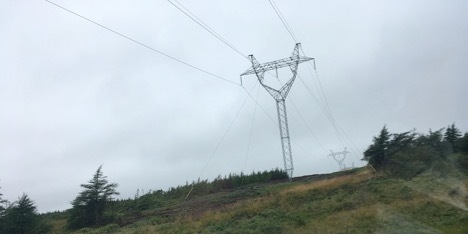 The most positive outcome is this new high voltage transmission line, which runs through the northern part of Zonte Metals Inc.’s (ZON:TSX.V)’s Cross Hills project. This picture is not from Zonte’s property but elsewhere, but it is the same transmission line. Electricity prices are a hot topic in Ontario, but Ontario folk may take some comfort that Newfoundland will soon join them and probably see rates way higher. Ontario has the third highest rates in Canada, and Newfoundland is about $0.01 per kilowatt hour (kWh) lower. After several days speaking with locals and seeing local news I learned all the transmission lines were, in part, about a project called Muskrat Falls. About 3,200 transmission towers were built because the project is far away from where any power is required. In fact, all this power is not required in Newfoundland either. In Newfoundland, Hydro is a provincial crown corporation under the umbrella of a company called Nalcor Energy, and is the primary generator of electricity in Newfoundland and Labrador, with an installed generating capacity of 1,637 megawatts (MW). In 2008, more than 80% of this energy was clean, hydroelectric generation. Hydro’s power-generating assets include nine hydroelectric plants, one oil-fired plant, four gas turbines, 25 diesel plants, and thousands of kilometers of transmission and distribution lines. The diesel plants are small and for remote areas. Why would a province with no growth need a huge new 3,000 MW hydro-generator, almost twice current capacity? Just considering the first phase, at 824 MW, is about a 50% increase over current capacity. The answer: it is not needed. Muskrat Falls is probably a bigger boondoggle than the likes we have witnessed in Ontario. Phase one at Muskrat Falls includes construction of an 824 MW hydroelectric-generating facility, over 1,600 km of transmission lines across the province, and the maritime link between Newfoundland and Nova Scotia. The original Muskrat Falls deal was designed to supply the island with low-cost hydro power to replace power generated at the oil-fired Holyrood power station, and to sell Emera 20% of the output for use by its Nova Scotia Power subsidiary. The balance was going to be sold to “lucrative U.S. power markets.” There is no doubt the original projected cost, between $5 and $6 billion, was low-balled because of either engineering incompetence or political posturingor some of both. The project got the go-ahead during the 2011 election campaign when Stephen Harper, desperate to win seats in the province, promised federal loan guarantees to get the dam and its lengthy transmission system from Labrador to the island, and on to Nova Scotia, built, despite an unconvincing economic case. The latest estimate for the project completion is $12.7 billion, more than double the original. There are estimates between $0.220.24 per kWh for the cost of generation. This is about double current rates in Newfoundland and no doubt makes this the most expensive large electrical generation in Canada. Muskrat Falls has actually become cheap power for Nova Scotia at Newfoundland’s expense. What a win for Nova Scotia. Think of it. Newfoundland said, “If you (Nova Scotia) connect to our grid, we will give you one-third of Muskrat Falls power free for 35 years.” Since there is no market for the rest of Muskrat Falls power, Nova Scotia is going to get another third at market prices of $0.030.04 per kWh. In essence, Nova Scotia will be getting two-thirds of Muskrat Falls power for a few pennies or less/kWh, while the cost to Newfoundland will be $0.220.24 per kWh. What a boondoggle. This is very sad for a province already saddled with huge taxes. Provincial fuel taxes are more than double almost anywhere else in Canada. Practically everything costs 10% to 25% more because it has to be shipped to Newfoundland by sea, since not much is produced there. However, the beautiful scenery and laid-back way of life is free. I love Newfoundland, and the people there are second to none. Mining discoveries and new mines would be very well received as the jobs are badly needed and the extra revenues to government coffers from the additional tax base are badly needed also. That said, let’s get into the mining mania that is gripping the province. The best explanation is the graphic. The circular structure outlined by the air magnetic in red is the intrusive outlining epithermal vein activity. Practically all the ground is now staked around this, and on the epithermal trend that continues to the northeast indicated by the red arrow, toward Zonte’s Wings project, and the arrow to the southwest, toward Marathon’s Valentine project. I found most of the projects are early stage and private. There is a good private project that will soon be vended into a public company, and I believe that will be a good one to jump on. It is advanced and drill-ready. As soon as news is out on that acquisition I will send out an alert. RJK Explorations acquired it. I was looking forward to visit the Sokoman project to gain a better understanding. However, when I spoke with the CEO, he came across quite unusual. He was not interested in me visiting the project, I was told there was nothing going on until September, there was nothing to see and there was no outcrops. The company’s presentation and news releases say otherwise. I spoke with him a day after I commented about the misleading news release and I would be surprised if SIC saw that; perhaps they did. A site visit would be an opportunity for a better understanding of the projectwho turns down free newsletter coverage? Something smells here, and it is not good. Misleading drill news that hyped a 11.9-meter intersect when it was only 1.35 meters. There has been trenching, 111 drill holes and no resource yet. I think the drill hit was simple luck. For now I will still follow it and let the chart and/or the next drill results make my decision on what to do next. We took profits out twice at higher prices, and sold the remaining position in the high $0.20s, so I will use an average of $0.38 as the selling price. This is how to calculate the grades outside the 1.35-meter high-grade intersect. First, find the total grams over the long intersect: 44.96 X 11.90 = 535.02 g/t. Next the high-grade portion: 385.85 X 1.35 = 520.90 g/t. Next, subtract the two-gram numbers and average over the outside portion of the high-grade intersect which is 11.90  1.35 = 10.55 meters. 535.02  520.90 = 14.12 g/t, so 14.12 g/t / 10.55 M = 1.34 g/t over 10.55 meters. This 1.34 g/t would not be economic in an underground mining scenario, and that is what we are looking at here, because it is under a lake. Really, there is no long intersect. The real result is 385.85 g/t over 1.35 meters, and this is high grade but a narrow intersect and most likely a lucky hit on that vein. In my update to sell a couple weeks back, I noted the stock will probably move down and continue to fill the gap from $0.24 to $0.42. 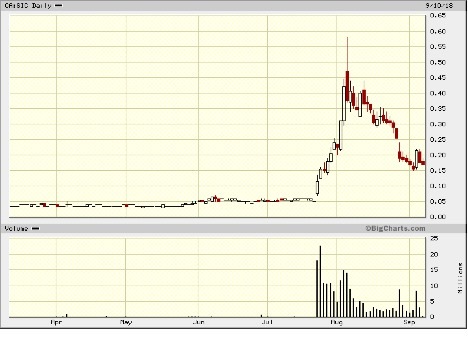 It actually went lower and shows signs that it might be consolidating between $0.15 and $0.20. I will wait for next drill results before I decided whether to jump back in or not. RJK announced its acquisition of its MGD project just as I was leaving for Newfoundland, and I did not have a chance to arrange a visit. There was probably nothing going on anyway, so soon after acquiring. I have a feeling I will be back to Newfoundland soon so will try a site visit then. This map gives a good idea of where RJK’s project is and location relative to SIC. In that regard the location is awesome. The MGD project is located within a northeast-trending belt of Silurian volcanic, volcaniclastic and sediment rocks. The project has considerable coverage of the large regional fault structure located in the area. The MGD project consists of approximately 12,896 acres (5,200 hectares). RJK paid quite a bit for this, and a 20-million share financing is quite dilutive. The good news is that Sprott and Palisades came into financing. The stock jumped higher and quickly, so often you see a correction back to the gap, weakness down to around $0.11 was no surprise. What really interests me about RJK is its second acquisition, Rolling Pond, announced last week. The Rolling Pond property consists of 3,550 hectares of highly prospective ground containing a large epithermal system within a structural corridor that extends for a distance of eight kilometers. 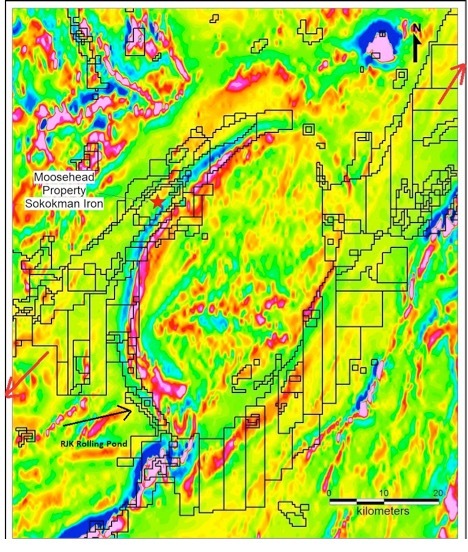 Historical exploration work performed by Altius Minerals Corp. (ALS:TSX.V) in 1998 included prospecting, mapping, ground-induced polarization/resistivity and high-resolution airborne magnetometer surveying. The results of this work successfully delineated a high-level sinter zone over a strike length of 1,100 meters, with an approximate width of 5060 meters along a small portion of the structural corridor. A follow-up, five-hole program not only confirmed the presence of the epithermal system at depth, but also successfully identified the presence of the boiling zone, as defined by the presence of bladed calcite and lattice textures. It was also noted that gold and base metal values increased at depth in the system and additional deeper drilling was recommended. Boiling zones are of significant importance in epithermal systems as they indicate the proximal locality for precipitation of gold-bearing fluids. RJK has applied for exploration and drilling permits with the intention of using the historical high-resolution airborne magnetics and induced polarization/resistivity surveys, along with the drilling data from historical drilling, to test the system below the boiling zone. A 3-D analysis of the historical drill data is currently in progress and field crews have been mobilized to site to begin preparatory work. RJK can earn a 100% interest in the Rolling Pond property by paying $50,000 cash and 350,000 shares on signing, and $50,000 and 350,000 shares on the first, second and third anniversaries of the agreement. The property is subject to a 2% net smelter return royalty, with the ability to buy back 1% for $1 million at any time. I went over this property with Dean Fraser and like the potential much more than what they have around Sokoman, mainly because Rolling Pond is more advanced and we will soon see some drilling. I marked the Rolling Pond property on the regional map I used preceeding Sokoman. 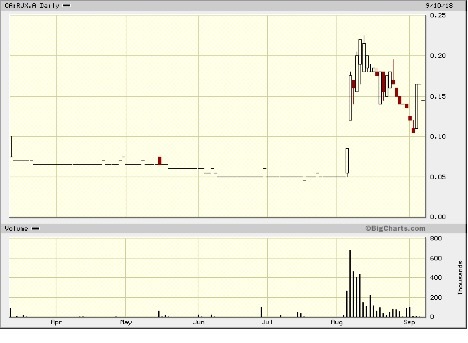 We did well selling around $0.20 and the stock came back down and started filling the gap between $0.08 and $0.15. It has been trading thin since that bottom at $0.11. I would try bids under $0.15 to buy back positions. The issue with all these projects around Sokoman is that they are epithermal vein systems and one has to do a lot of drilling to find the veins and see if they carry any good grades. Once orientation, strike and depth of the veins are determined, then infill drilling has to be done to prove resources. Often these veins have to be drilled on 250-foot centers. You’re looking at a lot of drilling, and if it is down deeper, even more costly. These can be very worthwhile if you have high grades, but as in the case of Sokoman, there’s 111 drill holes and no resource yet. Zonte is exploring a much different target at Cross Hills, a bulk tonnage iron-oxide copper gold (IOGC) system. White Metal Resources Corp. (WHM:TSX.V) is also exploring a different type of system. While Sokoman’s news brought a lot of attention to Newfoundland, perhaps the best is yet to come. Wait until Zonte makes a discovery at Cross Hills this year and the staking rush will go into an even higher gear. I met with Terry Christopher and Dean Fraser the night before we were going to head out to the project. Both are a wealth of knowledge. Terry has two discoveries under his belt and is a native of eastern Canada, and Dean, a native of Newfoundland, has also participated in large discoveries. I met Dean many years ago when he worked with another company and he is an intense, hard-working geologist and an expert geophysicist. Both Terry and Dean have a hard work ethic and work well together. Earlier in the summer, Bill Carson, a prospector, also aided in the systematic exploration on parts of the property. A key to understanding these IOGC systems is the magnetite, which is really the iron oxide that carries the other metals like copper, gold and silver. It is very easy to identify with a magnet and when I tested this sample the magnetic pull was strong. You can also do this in the field and keep in mind that the iron adds value to an IOGC system, but usually the copper is the key metal. I spent the next day investigating Zonte’s Cross Hills project and my timing was very fortunate. Christopher and his team have been working relentlessly and meticulously since the beginning of January overturning every rock and running high resolution ground magnetic surveys on this large project. It has paid off big time as the previous press releases have identified numerous large targets, many of which Zonte has yet to field check. Others, such as Dunns Mountain and K6, have delivered copper coincident with the large magnetic targets. Since early July the company has expanded the land position significantly to 123.25 square km and has submitted numerous samples to the assay labs. It appears, through its meticulous process culminating in these past several weeks, Zonte has figured out the controls of the system, orientation of known anomalies and how they tie together in an IOGC system. With this knowledge the company has been revisiting anomalies. There is very little experience in Canada on these systems, but Zonte does have some outside consultation. Previously it found little copper outcropping because surface rock was very weathered. Unraveling the alteration pattern, geologic setting and system controls at Cross Hills, the company discovered where and what rock types and surface features to look for. At one target I visited, I was able to observe surface copper showings throughout the anomaly and it appears the company has not sampled many of them, which is upcoming when assays are received. The pic below is an example of a magnetite vein on top of the Dunns Mountain anomaly. 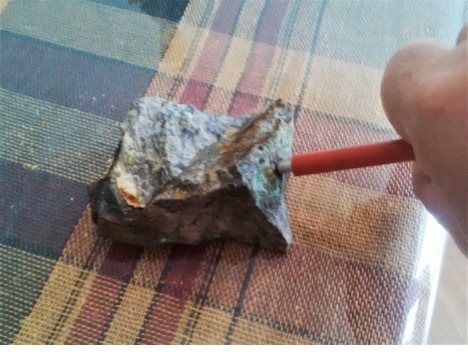 The color does not show well in this picture, but the vein is about as wide as the pen on each sidewhat looks blue-ish is actually green, indicating copper. With IOGC systems you have the main massive/breccia ore body down deep with mineral pulses creating veins above it, and above the veins the disseminated mineralization. It is very rare to find the veining exposed as indicated abovemost cases they are buried and you find the disseminated at best. Most anomalies in these systems are often blind or drilled in very little more than alteration. At the Cross Hills project copper mineralization is found at surface and at Dunns Mountain as veining throughout the target area. It pays to do all the long, detailed and hard work, and hats off to the Zonte team in doing this, and putting this puzzle together. As I mentioned, the iron oxide is key, and this is what Zonte’s magnetic surveys have been identifying. This is the Dunns target, and it shows the magnetite as very intense just 50 to 100 meters below surface. When you have magnetite veins running copper above this, there is little doubt the magnetic anomaly carries stronger copper values. The only question is what grades and what lengths of mineralization will be revealed by the drills. Zonte is planning more sampling, tightening up the magnetic surveys and might run IP surveys to help pin point drill targets. 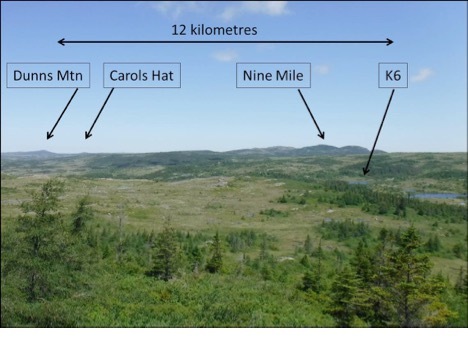 This picture is from Zonte, and shows Dunns Mountain, K6, Nine Mile and Carols Hat anomaly positions. It points out how vast the project is and that it might contain more than one deposit. After seeing this all for myself, and going over all the geology and data with Terry Christopher, I am convinced this will be a major discovery. Here is a little background on IOGC and what public info we know on Cross Hills so far. Most often IOGC systems are large, hosting billions of pounds of copper and millions of ounces of gold with iron. Zonte’s magnetic anomalies show up very large and strong. Typically you will see long intersects (hundreds of meters) of mineralization in these systems, and they are large open-pit operations. Grades can vary. A description at Investing News on copper: “IOCG ore bodies range from around 10 million tonnes of contained ore, to 4,000 million tonnes or more, and have a grade of between 0.2 percent to 5 percent copper, with gold contents ranging from 0.1 to 3+ grams per tonne. The tremendous size, relatively simple metallurgy and relatively high grade IOCG deposits can produce extremely profitable mines.” And that is why Zonte is focused on Cross Hills. The advantages Zonte has are location and infrastructure. There is paved road access to the project and a major high-voltage transmission line was put through the northern area of the project last year. Access to an Atlantic seaport is only about one hour away. This means a lower grade project could be economic. I am not saying this will be lower grade. At this point we don’t know and don’t have a deposit yet. Zonte released news Monday. It increased the land position significantly from 81.75 to 123.35 square kilometers after identifying controls of the mineralization. Christopher commented that the company will advance drill targets with about a month of additional work. Therefore it sounds like it will be drill-ready later in October. I often commented that the stock would fill the gap between $0.25 to $0.32 or so and has now done that. It may continue to trade there longer, just no way to be certain. 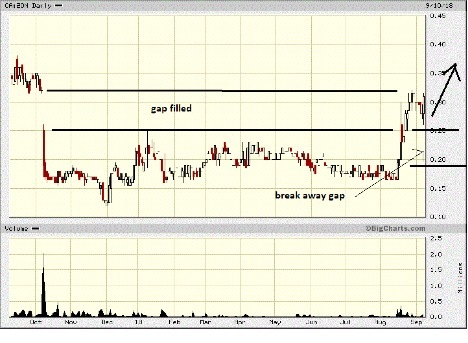 On the topic of gaps, we also have a breakaway gap from $0.18 to $0.25. They are identified with higher volume and we can see that higher volume. The good news is these breakaway gaps often repeat themselves a few times. For example, with Garibaldi (GGI:TSX.V), last year, it had four gaps. The first from around $0.25 to $0.60, the second gap $0.80 to $1.50, the third at $2.00 to $3.60 and a fourthfrom $3.75 to $4.75. In some cases timing did not work out well. In August many were on holidays and with the bear market on the TSX.V, many juniors have little funds to do any work. I headed up the peninsula to St. Anthony, probably the most beautiful part of Newfoundland. I believe I found WHM’s property but there was a very thick fog that day, even though the forecast was sunshine. We also planned to go whale-watching and the fog usually lifts by the afternoon, but not that day. I waited to 5 p.m. and the thick blanket of fog persisted, but when leaving, just 5 to 10 km down the highway, there was no fog. Unbelievable. But it was all fog, and that dam foghorn went off about every three minutes. It was no use taking any pictures so I used this pic from WHM’s presentation. WHM’s Gunners Cove project looks quite interesting and I have known its geo, Dr. Scott Jobin Bevans, for many years. 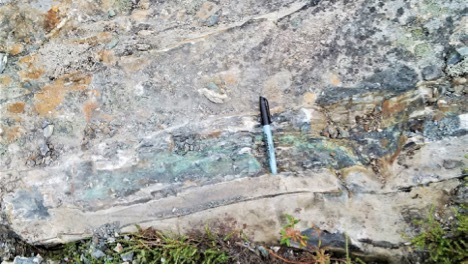 White Metals announced a financing Sept. 5 and has begun an important channel sampling program on seven priority targets at its Gunners Cove gold property. To date, 120 channel samples have been submitted to Eastern Analytical Laboratories in Springdale, Newfoundland, and a further 300 samples are expected to be taken in the coming weeks. 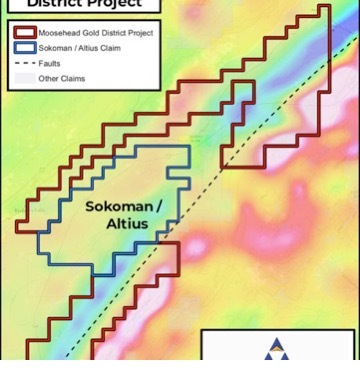 The Gunners Cove gold project is a new unexplored gold system that has now been traced intermittently for 18 kilometers along strike (north-south) and from 1.3 to 3 kilometers in width (east-west). It is quite a large project at 59,402 hectares and has good road access. It has some similarity to Zonte’s Wing’s project because it is sedimentary-based and in WHM’s case gold is hosted in black shales. This is much different than the Sokoman area, focused on veins. 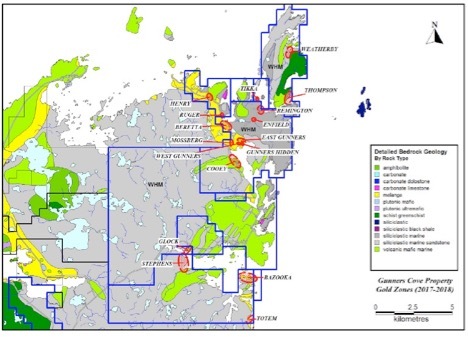 To date, 15 new areas of gold mineralization have been discovered, of which seven have been identified as high-priority targets. The seven priority targets that will be channel sampled include the Thompson zone, the East and West Gunners pit (discovery pit) and the Hidden pit, which is also located in the Gunners pit area. Also included in the program are the Stephens zone, the Totem zone and the Bazooka zone. 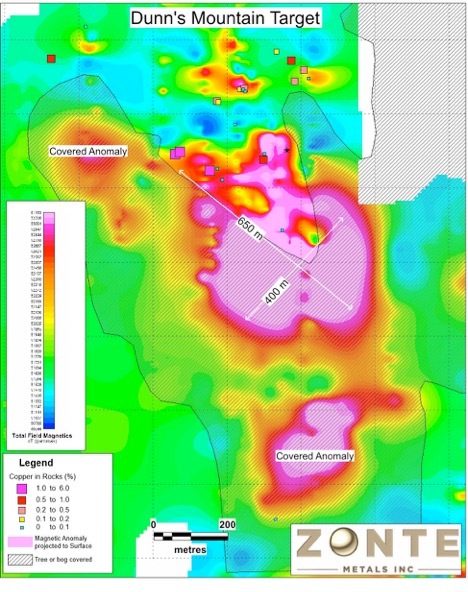 Grab samples taken across strike at the Bazooka zone area yielded anomalous gold concentrations over 1,000 meters across strike. Technical personnel for the company have designed the channel sampling program as the best way to properly evaluate the gold tenure and continuity on the various gold zones, as well as assist in the delineation of targets for a future diamond drilling program. Since the initial gold discovery in September 2017, the company has had excellent success not only in making new discoveries, but extending the area of gold mineralization substantially at the Gunners Cove gold project. Anomalous and moderate-grade gold assays are associated with 210% pyrite nodules, discontinuous stringers, fragments and cubic crystals. The gold zones are hosted in a geological distinctive unit of chaotic, multilithic breccia with a predominately graphitic and mudstone matrix. This unit is associated with regional thrust faulting and referred to as a melange. Anomalous silver, copper and molybdenum are also associated with the gold mineralization. I am going to look at this in some more detail and wait for channel sample results before deciding on whether to buy the stock. 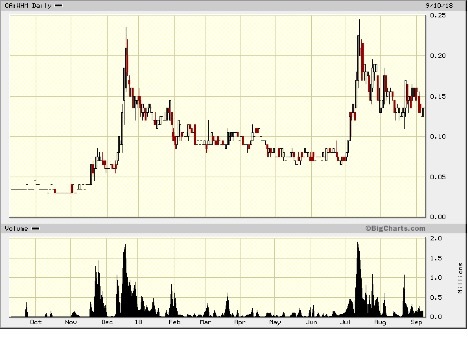 On the chart, there is resistance around $0.15 to $0.17, and higher around $0.23 cents. Support is around $0.08 to $0.11, and it appears it will probably trade between $0.10 and $0.15 cents ahead of channel sample results. 1) Ron Struthers: I, or members of my immediate household or family, own shares of the following companies mentioned in this article: Zonte Metals, RJK Exploration. I personally am, or members of my immediate household or family are, paid by the following companies mentioned in this article: None. My company currently has a financial relationship with the following companies mentioned in this article: None. I determined which companies would be included in this article based on my research and understanding of the sector.